There are approximately 1.5 million nonprofits in the United States alone, according to the National Center for Charitable Statistics (NCCS) and this number is increasing every day. With so many nonprofits out there, how can your organization stand out from the rest? Building awareness is essential to getting your nonprofit recognized, and there are multiple ways to do just that. Traditional advertising has been used since the beginning of time to build brand awareness for any business. Okay maybe not the beginning of time, but you see our point. The issue with traditional advertising these days is that most buying and certainly any research into worthy nonprofits is done online. So, how do you reach your audience in the age of digital? The answer is simple, content marketing is key. Another major benefit of content marketing is that it’s much less expensive than traditional marketing, and it may just be your answer to your prayers if you have a small marketing budget. My agency, ArcStone works with a lot of nonprofits. Some have ample marketing budgets but most do not. While it takes time to create quality content, it doesn’t cost money, so it’s a good option for smaller nonprofits with tight budgets. If you’re ready to roll up your sleeves and get started with a content marketing strategy, follow these three tips before launching your campaign. You’d be surprised at how many people skip this step. Before channeling your inner Hemingway, consider your goals. What are you hoping to accomplish with content marketing? Are you trying to improve your visibility for a specific service you offer? Is this an effort to increase your end of year contributions? Are you trying to build an email list? Do you want to want to improve engagement with your primary audience? It’s possible to measure the success of all of these goals, but setting up tracking will look quite different for each and is essential to monitoring the success of your efforts. Our favorite tool for tracking goals is Google Analytics. They offer detailed tracking and goal creation. To track a goal like engagement, look at session duration, pages per session, returning sessions, and bounce rate. Tracking these metrics can paint a picture of your audience behaviors and show you if your visitors are engaged. Other goals like building out email lists or increasing blog subscribers are easier to monitor. The main takeaway here though is to have these goals laid out before you start creating content. If you’re just starting to plan your marketing goals, use the SMART system. This will give you a robust and organized content marketing strategy from the start. A SMART goal is Specific, Measurable, Attainable, Relevant, and Time-bound. Put every goal to the SMART test, and you’ll be well on your way to an effective strategy. It’s not enough to trust your gut when it comes to understanding whether your campaign is effective. Make sure you are tracking and measuring your goals. You’d be surprised at the number of times this gets overlooked. Conversion goals are an integral part of getting the most out of Google Analytics. Use goals and events to see what content resonates with your audiences, how people are finding your content, and how they interact with it. An event can be as simple as tracking the button clicks when someone downloads your eBook or seeing how far down on the page they scrolled. Protip – Use Google Tag Manager to make tracking a variety of events and goals easier. Create content that’s valuable to your readers. It’s very easy to get caught in the trap of creating content that’s self-promotional and frankly, very boring. Trying to sell new visitors to your nonprofit when they’re just getting to know you, won’t be effective. It may even be a turn-off. The core of content marketing is that is should make your audience want to engage with your organization, so the content you create needs to do one of these things; entertain, inform, educate, or persuade your audience. It should solve their problems, inspire their passions, broaden their minds; you get the picture. Now it’s not all sunshine and rainbows, there is a bit of promotion involved in this type of marketing, but it’s not blatant in the way that traditional advertising is and was. Promote your nonprofit by outlining the incredible benefits that will come from donations, or the importance and values of volunteers. Be genuine in your promotions, because anything less will be obvious. 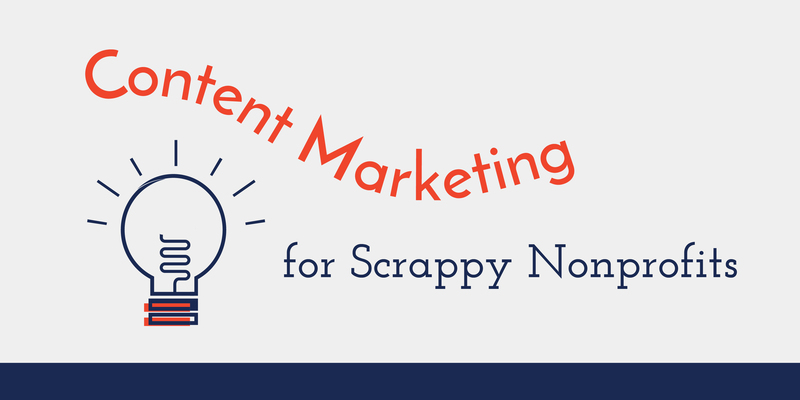 We hope this makes you a little more comfortable about launching a content marketing campaign. If you need any help along the way, please contact our marketing team.